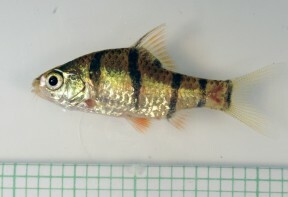 Wild caught specimen from Sibu Division, Sarawak, Borneo. 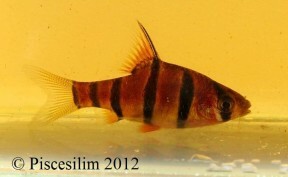 This individual displays the dark marking below the posterior base of the dorsal-fin which is characteristic of P. pentazona, but was apparentl collected in Johor state, Peninsular Malaysia which is outside its generally-accepted range. Specimen from southern Peninsular Malaysia pictured in the field. Another specimen apparently collected in Johor state, Peninsular Malaysia. pentazona: from the Greek πέντε (pénte), meaning ‘five’, and Latin zona, meaning ‘zone’, in reference to this species’ colour pattern. Type locality is given as ‘Baram River, Sarawak state, Borneo, East Malaysia’, which corresponds to the Baram River drainage in the Malaysian state of Sarawak, Borneo. It’s generally accepted to be endemic to the northwest of the island and possibly Sarawak, being replaced by the closely-related D. hexazona south of the Rajang River near Kuching city and in other parts of Borneo. Wild specimens shown in some of our images were apparently collected in the vicinity of Mersing, Johor state, Peninsular Malaysia, however, and both display the dark marking under the posterior dorsal-fin base characteristic of this species (see ‘Notes’). Most often inhabits peat swamps and associated black water streams as well as other still waters, often in areas with submerged grasses or aquatic plants and dense riparian vegetation. The water itself is typically stained brown with humic acids and other chemicals released by decaying organic material, dissolved mineral content is generally negligible and pH as low as 3.0 or 4.0. Filtration does not need to be particularly strong as it mostly hails from sluggish waters. In the aquarium it will accept dried foods of a suitable size but should not be fed these exclusively. Daily meals of small live and frozen fare such as Daphnia, Artemia and suchlike will result in the best colouration and encourage the fish to come into breeding condition. 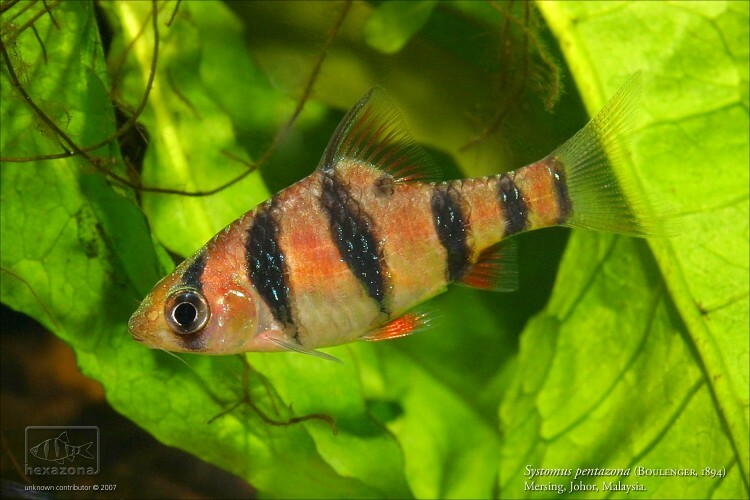 An ideal addition to a peaceful community of Southeast Asian fishes with comparably-sized, open water-dwelling cyprinids, cobitids, and certain anabantoids perhaps constituting the best choices. 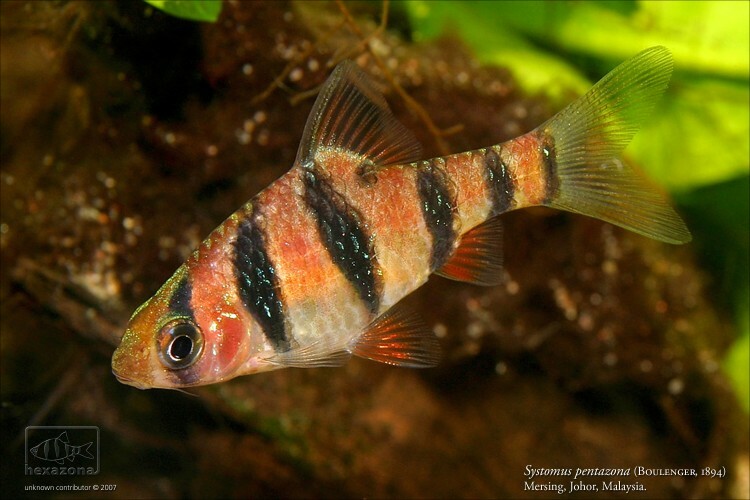 Some of the more commonly exported species from Borneo include Desmopuntius johorensis, D. rhomboocellatus, Brevibora dorsiocellata, Trigonopoma pauciperforatum, T. gracile, and several Pangio spp. Avoid boisterous or very vigorous tankmates as they may outcompete it for food. It’s a schooling species by nature, and ideally should be kept in a group of at least 8-10 specimens. 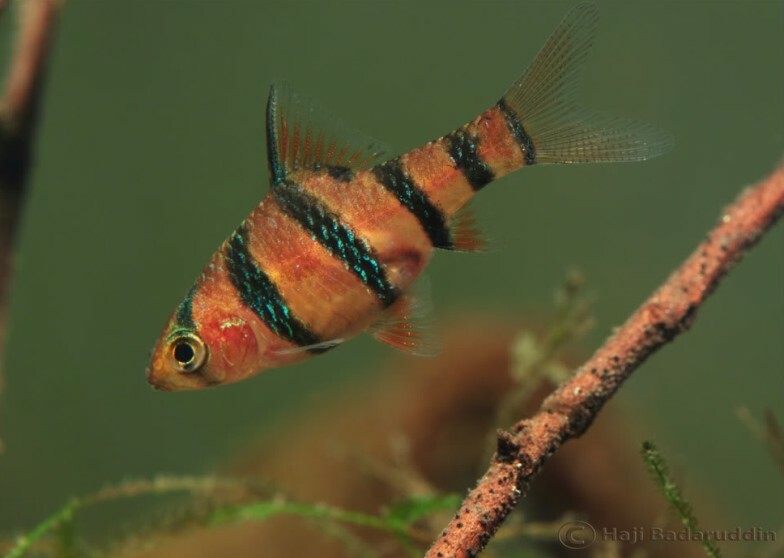 Maintaining it in decent numbers will not only make the fish less skittish but result in a more effective, natural looking display, plus males will also display their best colours as they compete with one other for female attention. The water itself should be of slightly acidic pH with a temperature towards the upper end of the range suggested above, and an air-powered sponge filter or air stone(s) should also be included to provide oxygenation and water movement. 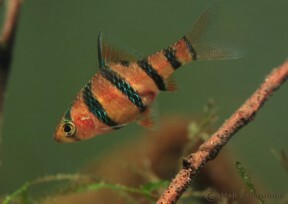 This species is rare in the aquarium trade with the majority of fish available under the name or the vernacular ‘pentazona barb’ being the closely-related D. hexazona. The two are almost identical in terms of both appearance and meristics but can be separated by the fact that D. pentazona possesses a small dark marking at the posterior base of the dorsal-fin which is absent in D. hexazona. The latter is also much the more widely-distributed with a range including southern Borneo (including southern Sarawak), Sumatra, and the Malay Peninsula. D. hexazona and D. pentazona are both included in a group of closely-related, similar-looking fishes which were moved into the new genus Desmopuntius by Kottelat (2013). They were formerly included in the Puntius assemblage which was for a number of years viewed as a polyphyletic catch-all containing over 100 species of small to mid-sized cyprinid until Pethiyagoda et al. (2012) published a partial review covering South Asian members. Some Colourful Fishes of the Genus Puntius Hamilton.